Welcome to Found Off The Street, our look at cars found on the cape that rust liked so much it decided to summer there; Cape Cod, MA. Today we have a 1957 GMC Panel Truck. Last week's 1966 Chevrolet Bel Air was in the process of being brought back to life after a few years sitting outside. This week's 1957 GMC Panel Truck has already gone through two restorations in the twenty years it has been in the current owner's possession. After spending several years sitting outside the old truck appears to be ready for round three. Before compact vans changed the commercial vehicle landscape in the early 60s, if you needed more enclosed space than a sedan delivery could provide you purchased a panel truck like this week's FOTS GMC. These windowless closed body vehicles featured no side windows from the rear door back and were usually built using design elements, chassis and drive train of a brand's. Not long after the pickup truck became popular most manufacturers began offering a panel truck body. Panel trucks were the go to commercial vehicle for many years. GMC had many years of panel truck production under their belt by 1957, when this panel truck was built. 1957 was only the second year it was possible to order a GMC truck from the factory with 4 wheel drive (it was the first year for Chevrolet). The Northwestern Auto Parts Company, better known to collectors as NAPCO, produced four wheel drive components under contract for GMC and Chevrolet between 1956 and 1959. Prior to this time NAPCO kits were available to Chevrolet and GMC truck dealers who wanted to convert trucks to four wheel drive. This week's FOTS panel truck was equipped with the factory four wheel drive and well as the optional Power Take Off. Underneath the big rusted hood is a 235ci Inline Six cylinder engine with a manual transmission behind it. Unlike a comparable Chevrolet panel truck in '57, this GMC could have been ordered from the factory with an automatic transmission and a V8. 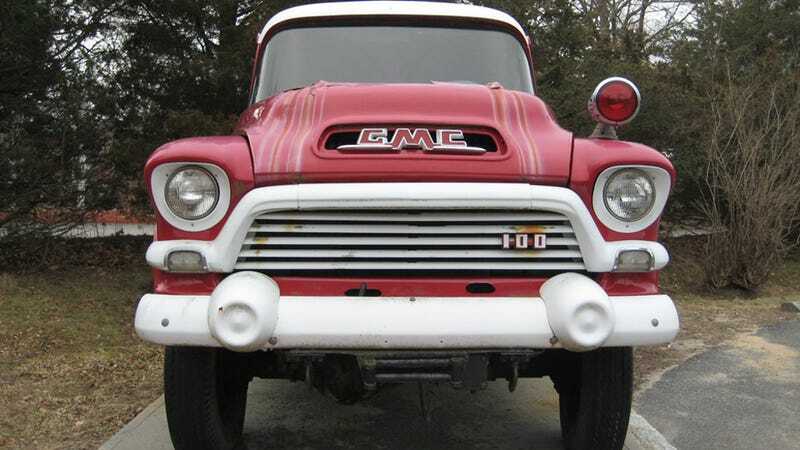 What makes this already awesome 1957 GMC even cooler is the fact that unlike many of our FOTS cars and trucks, I was able to easily locate a knowledgeable owner who knew the history of this truck. This old GMC has spent its whole life as a Massachusetts truck. It was originally purchased by the Department of Defense and was used by a government scuba diving team in central MA for many years. The truck spent the early part of its life painted blue and yellow which were the standard agency colors at the time. The GMC's current owner took possession of the truck 20 years ago and it has been on the cape that rust remembered ever since. As previously mentioned, this panel truck has been redone twice in those 20 years. Largely due to the fact the old truck spends all four seasons outdoors, the owner is quick to point out the truck is ready to be redone again. Although the truck runs, it currently has no brakes and as you can see from the picture is showing the rusty scars of a few decades spent by the sea. Sitting by the side of one of Cape Cod's more historic roads, this old truck has been drawing attention and customers to the liquor store it resides in front of for years. No matter what time of year this old red beast is hard to miss as you pass it. Even though I have become very comfortable seeing the old 4x4 parked as you see it in these pictures, every time I drive by a piece of me hopes it is gone. I know the owner has no plans of selling the truck and a briefly vacated parking spot is a sure sign the GMC is once again on its way back to being roadworthy.